Author of three histories based in the Civil War, World War I and World War II, Marc will talk about his inspirations behind each book and the decisions sitting presidents made in times of war. Filmmaker Darroch Greer will interview Marc regarding his writing process and motivations to delve into American history. From 2-5 PM. See EVENTS for more information. No Charge. This event has been rescheduled to Feb. 17 due to the closure of HWY 101 in Santa Barbara from the mudslides. We apologize for the inconvenience and hope you will join us over President’s Day Weekend. 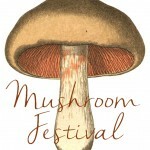 Our festival is a must for mushroom lovers! It is a culinary event not to be missed. The afternoon event unites mushroom and wine lovers alike to revel in the gustation of mushroom-centric dishes and Bedford wine. See Events for more details. This entry was posted on Tuesday, December 19th, 2017 at 3:24 pm	and is filed under News & Updates. You can follow any responses to this entry through the RSS 2.0 feed. You can leave a response, or trackback from your own site.